The following Data Nuggets are written by LTER scientists and created using LTER Data. To learn more about the ongoing collaboration between Data Nuggets and the LTER, check out our blog posts, “Data Nuggets: small activities with big impacts for students” and “LTER Data Nuggets: Breathing new life into long-term data“. 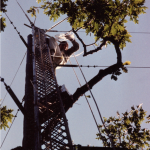 If you have any questions about the research in an LTER Data Nugget, or want help accessing original datasets, please contact us or the Education and Outreach Coordinator (EOC) for that site. Bye bye birdie? 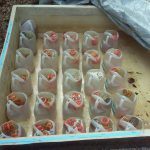 Part I Hubbard Brook Experimental Forest Sarah Garlick 2 Avian ecologists at the Hubbard Brook Experimental Forest have been monitoring bird populations for over 40 years. The data collected during this time is one of the longest bird studies ever conducted! What can we learn from this long-term data set? Are bird populations remaining stable over time? Bye bye birdie? Part II Hubbard Brook Experimental Forest Sarah Garlick 3 Hubbard Brook was heavily logged and disturbed in the early 1900s. When logging ended in 1915, trees began to grow back. 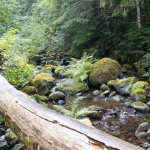 The forest then went through secondary succession, which refers to the naturally occurring changes in forest structure that happen as a forest ages after it has been cut or otherwise disturbed. Can these changes in habitat availability, due to succession, explain why the number of birds are declining at Hubbard Brook? Are all bird species responding succession in the same way? When whale I sea you again? Palmer Station Antarctica LTER Janice McDonnell 4 People have hunted whales for over 5,000 years for their meat, oil, and blubber. Today, as populations are struggling to recover from whaling, humpback whales are faced with additional challenges due to climate change. Their main food source is krill, which are small crustaceans that live under sea ice. As sea ice disappears, the number of krill is getting lower and lower. 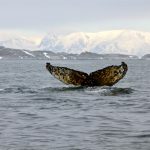 Humpback whale population recovery may be limited because their main food source is threatened by ongoing ocean warming. Lizards, iguanas, and snakes! Oh my! Central Arizona–Phoenix LTER Lisa Herrmann 3 People have dramatically changed the natural riparian habitat found along rivers and streams. In many urban areas today, these riparian habitats are being rehabilitated with the hope of bringing back native species, such as reptiles. Reptiles, including snakes and lizards, are extremely important to monitor as they play important roles in ecosystems. Are rehabilitation efforts in Phoenix successful at restoring reptile diversity and abundance? Bringing back the Trumpeter Swan Kellogg Biological Station LTER & Kellogg Bird Sanctuary Kara Haas & Julie Doll 3 Trumpeter swans are the biggest native waterfowl species in North America. At one time they were found across North America, but by 1935 there were only 69 known individuals in the continental U.S.! 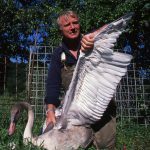 In the 1980s, many biologists came together to create a Trumpeter Swan reintroduction plan. Since then the North American Trumpeter Swan survey has been conducted to measure swan populations and determine whether this species is recovering. Growing energy: comparing biofuel crop biomass Kellogg Biological Station LTER & University Wisconsin-Madison GLBRC Kara Haas & Julie Doll 3 Corn is one of the best crops for producing biomass for fossil fuels, however it is an annual and needs very fertile soil. To grow corn, farmers add a lot of chemical fertilizers and pesticides to their fields. 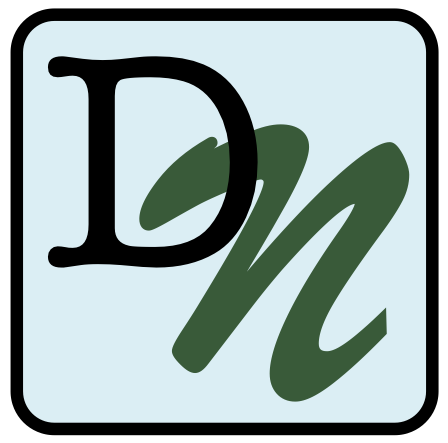 Other crops, like switchgrass, prairie, poplar trees, and Miscanthus grass are perennials and require fewer fertilizers and pesticides to grow. If perennials can produce high levels of biomass with low inputs, perhaps they could produce more biomass than corn under certain low nutrient conditions. Fertilizing biofuels may cause release of greenhouse gasses Kellogg Biological Station LTER Kara Haas & Julie Doll 3 One way to reduce the amount of greenhouse gases we release into the atmosphere could be to grow our fuel instead of drilling for it. Unlike fossil fuels that can only release CO2, biofuels remove CO2 from the atmosphere as they grow and photosynthesize, potentially balancing the CO2 released when they are burned for fuel. However, the plants we grow for biofuels don’t necessarily absorb all greenhouse gas that is released during the process of growing them on farms and converting them into fuels. The ground has gas! Kellogg Biological Station LTER Kara Haas & Julie Doll 3 Nitrous oxide and carbon dioxide are responsible for much of the warming of the global average temperature that is causing climate change. Sometimes soils give off, or emit, these greenhouse gases into the earth’s atmosphere, adding to climate change. Currently scientists figuring out what causes differences in how much of each type of greenhouse gas soils emit. Invasion Meltdown: will climate change make invasions even worse? Kellogg Biological Station LTER Kara Haas & Julie Doll 3 Humans are changing the earth in many ways, including adding greenhouse gasses to the atmosphere, which contributes to climate change, and introducing species around the globe, which can lead to invasive species. Scientists wanted to know, could climate change actually help invasive species? Because invasive species have already survived transport from one habitat to another, they may be species that are better able to handle change, such as temperature changes. Springing forward Kellogg Biological Station LTER Kara Haas & Julie Doll 1 & 3 What does climate change mean for flowering plants that rely on temperature cues to determine when it is time to flower? Scientists who study phenology, or the timing if life-history events in plants and animals, predict that with warming temperatures, plants will produce their flowers earlier and earlier each year. Cheaters in nature – when is a mutualism not a mutualism? Kellogg Biological Station LTER Kara Haas & Julie Doll 4 Mutualisms are a special type of relationship in nature where two species work together and both benefit. This cooperation should lead to each partner species doing better when the other is around – without their mutualist partner, the species will have a harder time acquiring resources. But what happens when one partner cheats and takes more than it gives? Fair traders or freeloaders? Kellogg Biological Station LTER Kara Haas & Julie Doll 3 One example of a mutualism is the relationship between a type of bacteria, rhizobia, and plants like peas, beans, soybeans, and clover. Rhizobia live in bumps on the plant roots, where they trade their nitrogen for sugar from the plants. Rhizobia turn nitrogen from the air into a form that plants can use. Under some conditions, this mutualism could break down, for example, if one of the traded resources is very abundant in the environment. The mystery of Plum Island Marsh Plum Island Ecosystems LTER & The TIDE Project Liz Duff 3 Salt marshes are among the most productive coastal ecosystems, and support a diversity of plants and animals. Algae and marsh plants feed many invertebrates, like snails and crabs, which are then eaten by larger fish and birds. In Plum Island, scientists have been fertilizing and studying salt marsh creeks to see how added nutrients affect the system. They noticed that fish populations seemed to be crashing in the fertilized creeks, while the mudflats were covered in mudsnails. Could there be a link? Urbanization and estuary eutrophication Plum Island Ecosystems LTER Liz Duff 4 Estuaries are very productive habitats found where freshwater rivers meet the ocean. They are important natural filters for water and protect the coast during storms. A high diversity of plants, fish, shellfish and birds call estuaries home. Estuaries are threatened by eutrophication, or the process by which an ecosystem becomes more productive when excess nutrients are added to the system. Parts of the Plum Island Estuary in MA may be more at risk from eutrophication due to their proximity to urban areas. Does sea level rise harm saltmarsh sparrows? Plum Island Ecosystems LTER Liz Duff 3 For the last 100 years, sea levels around the globe have increased dramatically. Salt marshes grow right at sea level and are therefore very sensitive to sea level rise. Saltmarsh sparrows rely completely on salt marshes for feeding and nesting, and therefore their numbers are expected to decline as sea levels rise and they lose nesting sites. Will this threatened bird species decline over time as sea levels rise? Keeping up with the sea level Plum Island Ecosystems LTER Liz Duff 3 Salt marshes are very important habitats for many species and protect the coast from erosion. Unfortunately, rising sea levels due to climate change are threatening these important ecosystems. As sea levels rise, the elevation of the marsh soil must rise as well so the plants have ground high enough to keep them above sea level. Basically, it is like a race between the marsh floor and sea level to see who can stay on top! Is your salt marsh in the zone? Plum Island Ecosystems LTER Liz Duff 3 Beginning in the 1980s, scientist James began measuring the growth of marsh grasses. He discovered that their growth was higher in some years and lower in others and that there was a long-term trend of growth going up over time. Marsh grasses grow around mean sea level, or the average elevation between high and low tides. Are the grasses responding to mean sea level changing year-to-year, and increasing as our oceans warm and water levels rise due to climate change? Marsh makeover Plum Island Ecosystems LTER Liz Duff 3 The muddy soils in salt marshes store a lot of carbon, compared to terrestrial dry soils. This is because they are low in oxygen needed for decomposition. For this reason they play a key role in the carbon cycle and climate change. If humans disturb marshes, reducing plant diversity and biomass, are they also disturbing the marsh's ability to sequester carbon? If a marsh is restored, can the carbon holding capacity also be brought back to previous levels? 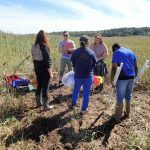 Invasive reeds in the salt marsh Plum Island Ecosystems LTER Liz Duff 2 Phragmites australis is an invasive reed that is taking over saltwater marshes of New England, outcompeting other plants that serve as food and homes for marsh animals. Once Phragmites has invaded, it is sometimes the only plant species left, called a monoculture. Phragmites does best where humans have disturbed a marsh, and scientists were curious why that might be. They thought that perhaps it was caused by changing salinity, or amount of salt in the water, after a marsh is disturbed. Can a salt marsh recover after restoration? Plum Island Ecosystems LTER Liz Duff 2 Before restoration began, it was clear the Saratoga Creek salt marsh was in trouble. Invasive Phragmites plants covered large areas of the marsh, crowding out native plants and animals. Human activity was thought to be the culprit – storm drains were dumping freshwater into the marsh, lowering salinity. In 1999 a restoration took place to divert freshwater away from the marsh in an attempt to reduce Phragmites numbers. Did it work? Make way for mummichogs Plum Island Ecosystems LTER Liz Duff 4 Mummichogs are small fish that live in tidal marshes all along the US Atlantic coast. Because they are so widespread and can be found in most streams, they are a valuable tool for scientists looking to compare the health of different marshes. The absence of mummichogs in a salt marsh is a sign that it is highly damaged. Students collected data on mummichog numbers before and after a marsh restoration. Did the restoration successfully bring back mummichogs to the marsh? The case of the collapsing soil Florida Coastal Everglades LTER Nick Oehm 4 The Everglades are a unique and vital ecosystem threatened by rising sea levels due to climate change. Recently scientists have observed in some areas of the wetland the soils are collapsing. What is causing this strange phenomena? Sea level rise might be stressing microbes, causing carbon to be lost to the atmosphere through increased respiration. Are forests helping in the fight against climate change? Harvard Forest LTER Pam Snow & Clarisse Hart 3 In the 1990s, scientists began to wonder what role forests were having in the exchange of carbon in and out of the atmosphere. Were forests overall storing carbon (carbon sink), or releasing it (carbon source)? To test this, they built large metal towers that stand taller than the forest trees around them and use sensors to measure the speed, direction, and CO2 concentration of each puff of air that passes by. These long term measurements can tell us whether forests help in the fight against climate change. All washed up? The effect of floods on cutthroat trout Andrews Forest LTER Kari O'Connell 2 Floods are very common disturbances in streams. If floods happen right after fish breed and eggs hatch, young fish that cannot swim strongly may not survive. Although floods can be dangerous for fish, they are also very important for creating new habitat. Cutthroat trout are a species of fish living in Mack Creek, which experiences occasional floods. Trout breed in the early spring, right at the peak of flooding, so scientists are collecting long-term data on this species. Will floods hurt trout populations or help?